Without trying to be a doomsayer, it’s no secret that we face some huge social and environmental challenges in our world today. 1.3 billion tonnes of food is wasted every year, yet one billion go hungry every day; more than eight people a day in Australia die of suicide, most due to mental health; and in Victoria alone, one woman dies every week at the hand of her current or previous partner. As individuals, we all share a collective responsibility to leave a positive impact on the world, just to be a good human. But I think there is even more of an onus on our industry and our strategic and creative problem-solving ability, to help remedy society’s wicked problems. 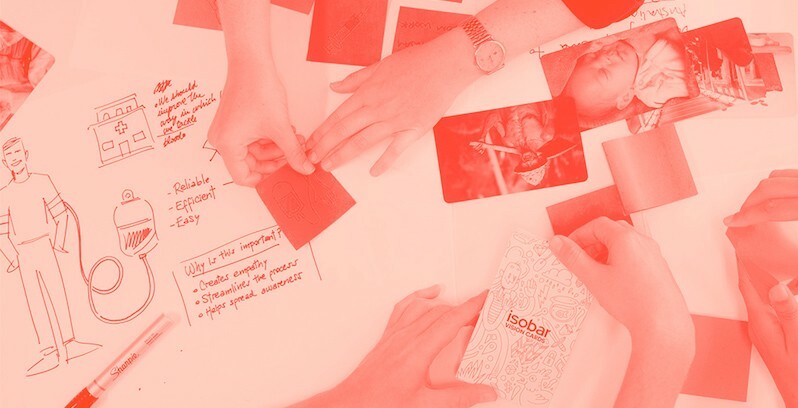 At Isobar, we believe good design and intent may be the key to creating sustainable and enduring communities of tomorrow. Isobar Good, our business division dedicated to social impact, is striving to do exactly that. We’re calling it ‘experience-led transformation for society’; using our skills to enable organisations to do ‘more good’ and in term to deliver more shareholder value. With digital as the enabler, we can create both positive social impact and commercial return. Every day, we work with our clients to design experiences that are focused on the end user — whether that’s an improved journey through the airport, a smoother online experience with your bank or a simplified shopping experience with your favourite retailer. In these cases, we broadly use time and money to establish the impact on our audience and the ROI for our clients. It’s how most agencies operate, and we’ve built a successful industry around it. Why not focus these skills to making the world a better place? Using experience design, and our creative and technology capabilities to help communities in need, measuring the direct impact beyond time and money, against real human problems. And I don’t mean those pro-bono advertising campaigns that create awareness for amazing charity organisations but treat the symptoms and not the cause. Let’s face it, most agencies are trying to win an award to match their good intentions. The UN’s 17 Sustainable Development Goals provide the perfect framework for this. Established in 2015, these goals are designed to tackle big problems that are sadly present the world over; aiming to end poverty, protect the planet, and ensure everyone has access to good health and education. By directly addressing these goals in the work we choose to do through Isobar Good, we can develop transformative initiatives that will change the world. Beyond affecting social change, there are plenty of other good reasons to take this approach. In the process of improving human lives and the communities we live in, we can create a working environment that people want to be a part of beyond the excitement and energy found in creative/digital agencies. We can forge meaningful corporate partnerships and explore diverse sources of revenue. And we can provide work with purpose beyond commercials, motivating our people more than money ever can. Corporate Australia can also benefit from evolving from the ‘CSR’ programme which has traditionally centered on volunteer and pro-bono activity, with little access to C-suite influence and funding. This work often revolves around one-off fundraising initiatives or taking a team day off to plant trees or help in a soup kitchen. This work is all meaningful, but we need to take a longer-term view. Organisations are realising that being in the business of making money is not enough. Whether you’re a bank, a car company, a charity, or a technology start up, whether you give, or whether you’re someone in need, nobody can operate without thinking about impact anymore. Social impact, environmental impact, community impact, diversity, sustainability — organisations are on the hook to make change happen and most of them now have a mandate to report on how they’re having an impact in these areas. Our industry is perfectly positioned to help them do that. There is a misconception that there is a lack of money in the social impact space. A whopping US$650 billion misconception. And the opportunity is even more substantial long term: sustainable business models could open economic opportunities worth $12 trillion and increase employment by up to 380 million jobs by 2030. There are already plenty of great examples of our industry rolling up its sleeves to create work that makes a difference. What I want to see is a shift in our perception of this work, from the occasional token pro-bono effort to a real business focus, with real revenue ambitions. We should also be charging normal rates for this stuff: we are talented; this work should be prioritised like any other paying client, and we should be working with clients who value social impact work by putting their money where their mouth is. The opportunity is there for the taking and this work should become a part of everything we do. If we can change the world along the way, more power to us. Konrad Spilva is CEO Isobar Australia, Head of Innovation, Dentsu Aegis Network ANZ and co-founder of Isobar Good. ‘Gateways to Impact’ report, Industry Survey of Financial Advisors on Sustainable and Impact Investing, June 2012. This article first appeared in AdNews as ‘Making a business case for social good’, 25 January 2019. We’re Isobar Australia, a leading digital agency transforming brands, businesses and people’s lives through the creative use of digital.